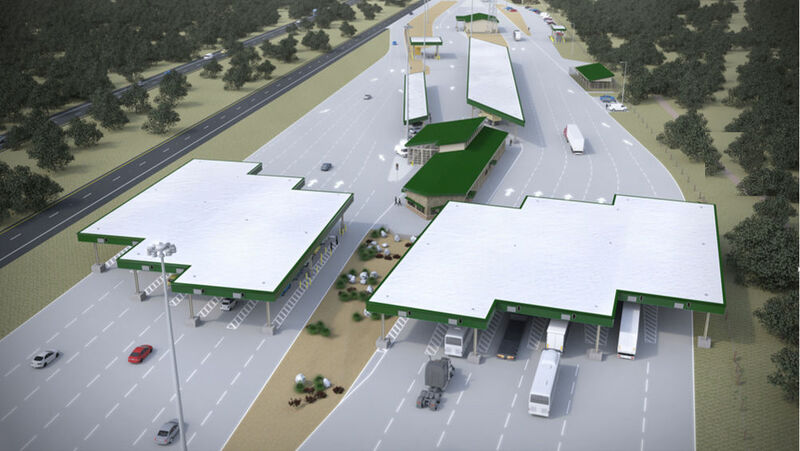 An artist's rendering of the plans for the expanded Border Patrol checkpoint near Falfurrias. EDINBURG — Ten thousand vehicles pass through the Falfurrias checkpoint every day, most of them personal vehicles, commuter buses and commercial tractor trailers. While not as common, ambulances also pass through to transport patients to higher-level care facilities in San Antonio and Houston when air transport is not viable. Representatives from the Rio Grande Valley’s largest hospitals and emergency medical services met Friday with U.S. Border Patrol leadership from the Rio Grande Valley Sector to discuss the agency’s protocol for inspecting ambulances carrying patients whose immigration status may be in question. “We’ve had a policy for several years, but it’s not very well-known,” RGV Sector Chief Manuel Padilla told those in attendance, noting that the goal of the policy is to “streamline” the movement of patients through the border’s busiest sector. Padilla further stressed that no individual or vehicle is “exempt from inspection” at any of the region’s interior checkpoints, regardless of medical status, because the agency is required to uphold the nation’s laws. Theresa Brooks, director of policy and compliance for the RGV Sector, urged hospitals to “pre-emptively” inform checkpoint staff in advance that someone who is in the United States illegally will be passing through the checkpoint via ambulance “to prevent a delay at the checkpoint” in non-immediate emergency situations. Doing so, she said, enables Border Patrol staff “to expedite the person through the checkpoint” by modifying standard checkpoint procedures, possibly following an ambulance to its final location or sending agents to meet it at the hospital in order to inspect someone. In immediate emergency situations, which Brooks described as life-or-death situations, agents “will do everything they can to get that vehicle through the checkpoint … (by) asking the minimal questions,” she said. The agency does not turn an ambulance around if it is carrying someone who is not authorized to be in the country, nor does it prevent someone from receiving medical care due to immigration status, a Border Patrol official noted. Passing through a checkpoint, however, puts undocumented immigrants in a predicament: If they leave the Valley and Border Patrol becomes aware of their status, they will receive a notice to appear before an immigration judge who oversees removal proceedings for immigrants in the United States illegally to ultimately decide on deportation. “That puts us in the near impossible situation to where we have to convince a patient and their family … of you really need this medical care,” said Wesley Milum, a registered nurse and emergency room director at Valley Baptist Medical Center-Brownsville, of the reality of how that could impact their life. He further noted that this would happen regardless of how smooth the process is of getting an ambulance through a checkpoint.